Attached character gets +1 STR for each plot card in your used pile. 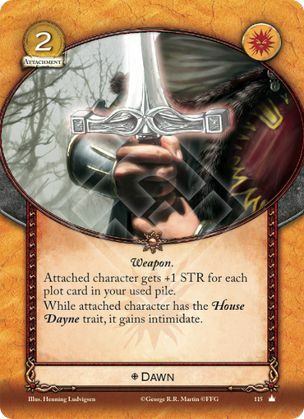 While attached character has the House Dayne trait, it gains intimidate. When Dawn enters play, it creates a lasting effect that gives the attached character a separate "+1 STR" modifier for each plot in the used pile. Because each plot that enters the used pile represents a different application of a different "+1," Randyll Tarly's reaction could be triggered when Dawn enters play AND each time a new plot enters your used pile (i.e., each time a new "+1" is applied to him).